After reading this book it reminded me very much of our textbook. Many of the ideas and theories presented in this book were first introduced to me in the textbook. Most of the concepts were expanded on with more examples given which gave me a better understanding. This book explains in four parts why we make errors in many of our beliefs and how we can change to help ourselves understand some of the most misunderstood problems. Sometimes it's our self interest that lands us in trouble while other times it can be getting information from secondhand sources that aren't the most reliable. We also like to believe the things we hear that confirm our beliefs while shutting off when hearing opposite view points. We do this knowing that more information and more credible sources go against some arguments we want to make yet we still make this error. My favorite part of the book would be the concept of having "hot hands". The hot hands fallacy is the idea that a basketball player has hot and cold streaks. If a player makes a shot he is supposed to be more prone to making a second shot then making a third shot. And a cold streak would have that same player miss one shot then they would be more likely to miss consecutive shots. This fallacy was first brought up in chapter two of the textbook and appears in this book in chapter two as well. The reason why I like this part of the book most is because it deals with sports and I have experiences dealing with this fallacy. I always thought of this fallacy as being incorrect because from playing basketball as well as other sports I feel like confidence and stress levels make a difference on overall performance. When making a shot it always felt like the second would be made and then there would be a groove. Whereas if I had a few misses I felt like one would never go in. One point in the book made great sense to this whole hot hands theory was at the bottom of the first paragraph on page fourteen. "Our analysis of two seasons of free-throw statistics by the Boston Celtics indicate that the outcomes of consecutive free throws are independent. On average, the players made 75% of their second free throws after making their first, and 75% after missing their first". This is a good argument that shows that there is little if any difference in good and bad streaks. This book has many of the same ideas that we read through in the text. the "hot hands" fallacy being one which I wrote about in the preceding paragraph. Another is in chapter four about different outcomes either being two sided which both events, positive or negative carry emotional weight and would both be remembered. And one sided events which like in the one example with six doors would only have a lasting memorable effect if it were negative. Five of the six doors were unlocked daily while one was almost always locked. Most days the person traveled through the unlocked doors which would give them no reason to remember that experience. But as they go through the locked door they remember this as negative . Self help tapes are only based on sales rather then actual effectiveness. The bombing of London was a good example of the clustering illusion. Two areas seemed to be prime areas for attacks but it was mere chance that it ended up that way. Chapter eight goes on about the alternate medicine and treatments that was discussed in the textbook often. Arthritis in the text showed no severity when accompanied by rainy weather and in this book the use of oil on joints supposedly helps arthritis yet is only another bogus therapy used. The picture above was taken from an article on express.co.uk in May of 2011 named, How Stalin and Mengele plotted the UFO invasion. A few years ago I ran into this article on AOL news and being interested in this sort of subject I decided to read it. It tells of a conspiracy that Soviet Russia intentionally flew an unidentified aircraft into the United States to scare the population during the Cold War. 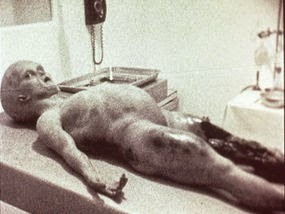 Stalin teamed up with former Nazi Joseph Mengele to create an alien like human being and have the body be recovered. I thought of this article as entertaining and very farfetched but this is a good example of the media taking factual places such as Area 51and twisted the story around. Chapter six is exactly what this story was all about, believing what we are told, in this case believing what we read. Was it to trick people into believing that it was true or just an entertainment ploy? Either way I'm sure they got both viewers of it as entertaining and believing it was actual facts. After reading this book I have learned to stay cautious at many beliefs I have. When watching news stories that have an interesting "off the wall" topic I'll take less stock in its authenticity and read up on the facts from other more credible sources. I feel like now on Wednesday nights during my baseball league I'll be thinking about my at-bats to see if I have certain cold or hot streaks trending and see if it holds up against the "hot hands" fallacy. Being a person that looks up many facts online I now have to second guess a lot of the information I read and hopefully will help me not only in school but outside of it as well.